When I was very small, I crawled to catch anything that moved. Nature was the source of all wonder and curiosity to me. Every screech, squawk, flicker of wing, wriggle, buzz and hum; filled me with a desire to learn more and now that I can understand it, feel connected to a world which was overwhelming and confusing. I was ‘diagnosed’ with Asperger’s when I was 5. Life was isolated and difficult…but I continued to learn, write, photograph and feel joy in doing heartfelt things. People said ‘obsession’ but that is a separate thing, nature was and is as big a part of me as my own heartbeat – it governs the beat of the best part of me. Living in Belfast was a yelling cacophony of piercing noise. Everything about the constant buzzing was a struggle for me, I couldn’t fade out the noise to hear what mattered. The birdsong was sullied by airplanes, the relentless traffic; you couldn’t escape it, even when you tried. My parents did try but we were all feeling the pressing down of a busy life. My two siblings are also autistic, as is my mum. Something had to change. In 2013 my dad, who is a conservation scientist, transferred from Belfast to County Fermanagh, we moved and life started to change for us. The volume was turned down enough to hear things and we discovered quiet places so alive with wildlife, I felt a surge growing inside me. I love this place, every place we go to, magic happens. My mind’s screaming volume turns down and thoughts and words start to spill out. I thought people might like to hear my thoughts, but mostly I wanted to have a journal of sorts, where all my collection of days and moments could be in one place. A place where I could express myself and feel a freedom to ‘speak’, a freedom which life couldn’t quite give me, in real time. I started my blog in June 2016 and I have been overwhelmed by the reactions to it, from the wider world! I’ve met some wonderful people and have had extraordinary opportunities. 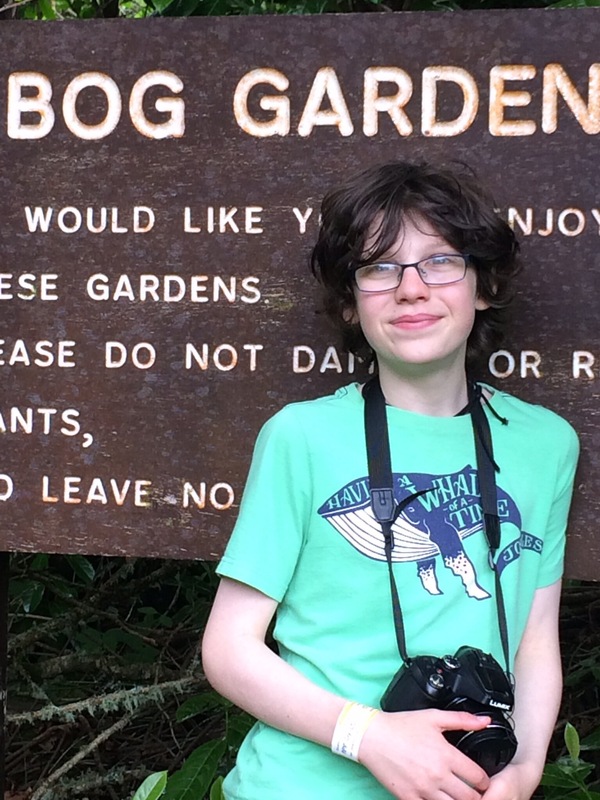 My blog won the youth category for The Wildlife Trusts 30 Days Wild 2017 campaign and I also won the yearly ‘competition’ – best blog of 2016 – organised by A Focus on Nature. It’s been a crazy year! I have pushed myself to the limits of my comfort zone, doing things I was literally scared to death of doing…palpitations, and actually feeling sick…talking to people, experiencing places, people and situations I felt overwhelmed by. I want people to know though, that those who are autistic or Asperger’s can achieve things – in a nurtured environment, in a society where acceptance and not tolerance, is the norm. To autistics – that the anxiety will get better, the more challenges you give yourself – especially if it’s related to something you love and feel passionately about. People don’t realise how hard people who are autistic try, how much we have to keep at bay, process, faze out. The excruciating pain of trying to control our out of control brains; to do ‘difficult’ things, things which will hopefully in the future, help others to follow hopes and dreams. 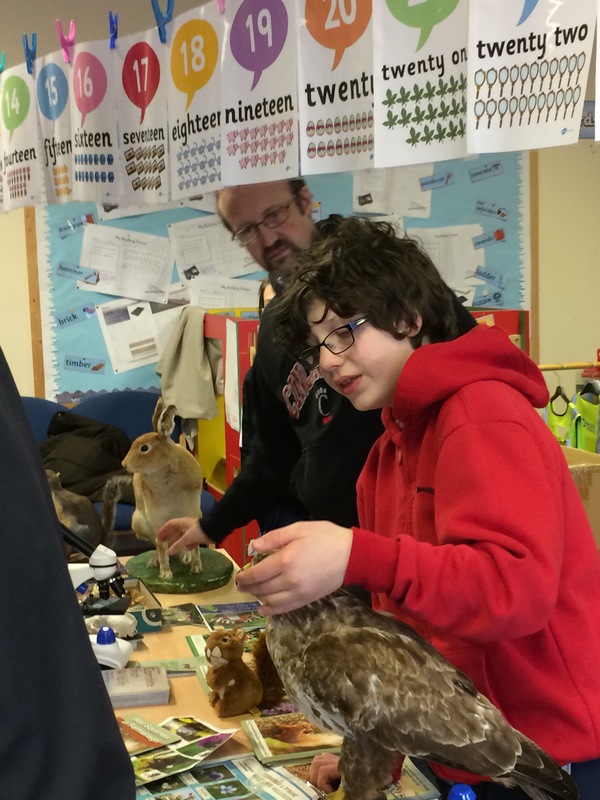 I volunteer with my local Red Squirrel Group record sightings and monitor Hen Harriers with Northern Ireland Raptor Study Group and I organise wildlife awareness displays for schools and organisations (the first time I did this, I had to breathe into a paper bag!). 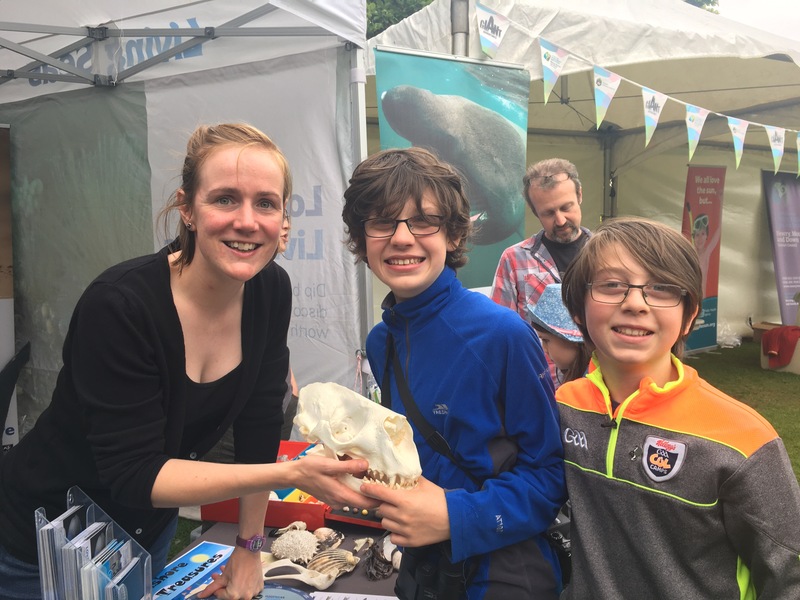 I engage with young people all the time, nurturing their connection with nature and exposing them to ideas and ways in which they can help too! I’m also a young bat worker and help my dad with the many rescue bats which he brings home. 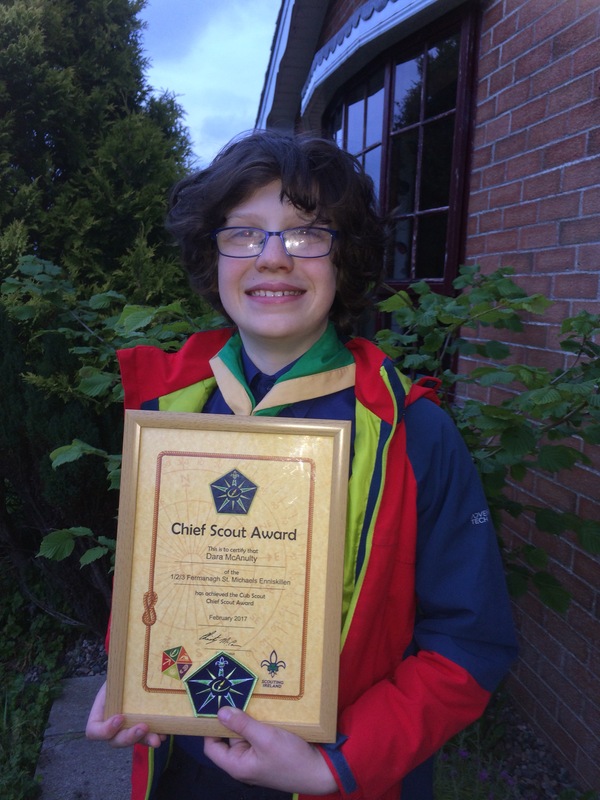 I’m a proud scouter and I was awarded the Chief Scout Award in July 2017, for my service to environmental work. I couldn’t have achieved this without the help and support of my scout leader – people are out there, waiting to help and support us, keep looking if you haven’t found the right person or place. You will. I hope. 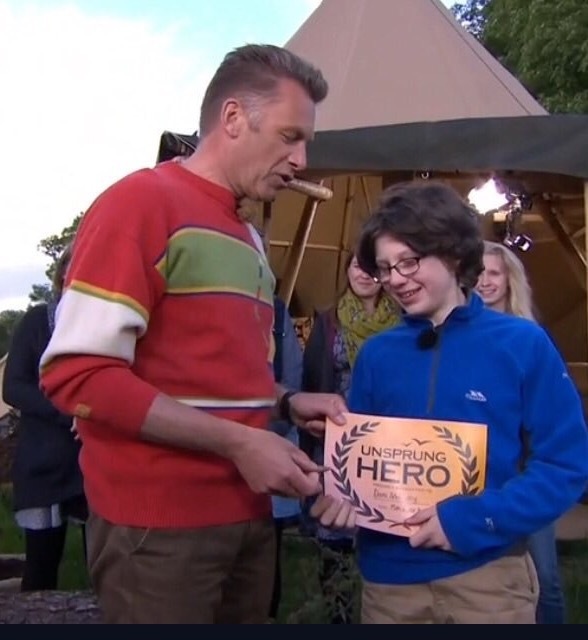 In June 2017 I was awarded the BBC Springwatch Unsprung Wildlife Hero Award. 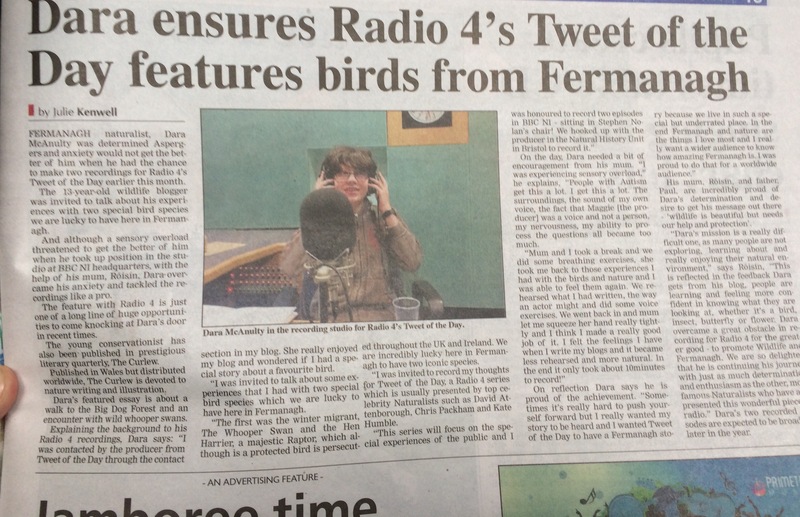 The highlight…when Chris Packham said I was his ‘hero’ too. I’ve also appeared on BBC Northern Ireland’s ‘Homeground’ to promote my local area and its biodiversity. Now, that was another brown bag moment! If you knew what to look for, you would see me clench my muscles so tightly, to keep control, to block out everything else except what I have to concentrate on. I did it though, because of the clarity of my passion. I needed a dark room and some Harry Potter (actually, a lot of Harry Potter – those books have been the rescue of many a dark moment!) afterwards, but I did it. My writing has been published by The Wildlife Trusts, New Nature, Wader Quest, The Curlew and Wildlife Watch. The writing is the easiest bit, socially. Phew!! I was a guest speaker for Hen Harrier Day Northern Ireland in 2017 (tip, look at the back of the room, above all the heads and zone out!) and I also volunteered with Birders Against Wildlife Crime at the 2017 Birdfair. Apparently I was pretty good at this?! Surrounding yourself with like minds, instead of cool or popular minds – I’d advocate that. In November 2017, I gave my first talk for Ulster Wildlife’s Grassroots Challenge celebration night (with Simon King! ), before I stood up to speak, I felt not stress, but so much love for the things I am passionate about. I stood up and I spoke and I sailed free. Every time I complete something new, it gives me hope and it creates hope for others. It ignited my passion further and gets me closer to meeting my goals – to be a conservationist and an advocate for nature. 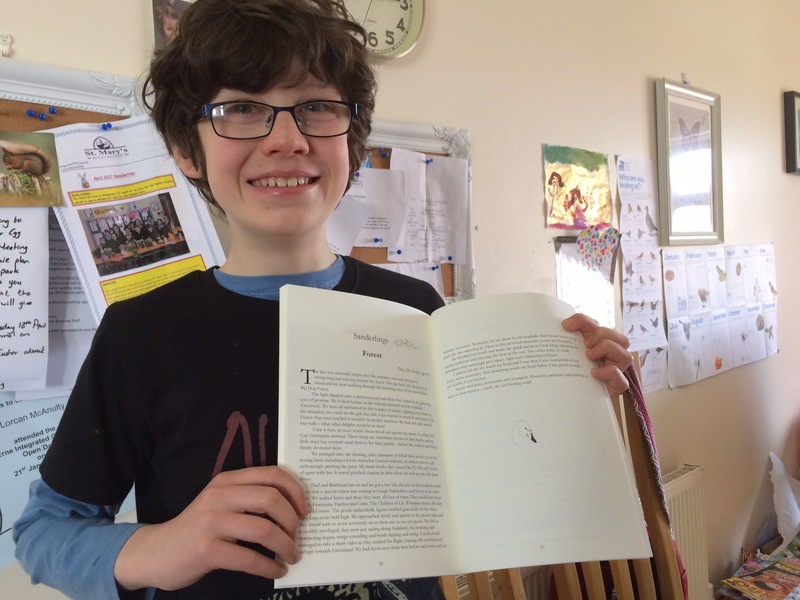 Writing about Aspergers and how nature has helped me cope with my difficulties and differences is really important to me because through the rays of positivity, I have intensely gnawing doubt and perfectionism – shouting above it stops me from drowning. My experiences have been mostly amazing and life affirming. However, I’ve also been bullied, isolated and made fun of – it won’t stop me. Instead, I hope to further grow and spread the message of environmental awareness, local biodiversity and conservation through my writing and campaigning in the future. I hope to keep going and pursue the things I love, regardless of how difficult it is. Words, as a means of communication and compassion, have become incredibly important to me and I’m now experimenting with different styles, always looking for ways to improve and grow. I’m writing a book called ‘Diary of a Young Naturalist’ I’m working with an amazing publisher to get it out into the world. Encouraging to both children and the inner child of adults. I want to light a spark, see it glow. I couldn’t do all of these things alone. I’m lucky to have amazing people who support and mentor me. I would be lost without their knowledge and understanding. Special thanks to my family, Eimear Rooney, Emily Joächim, Robert MacFarlane, Mark Avery and Chris Packham, for guiding me through – and to all of you; readers, encouragers and especially those who motivate me to do more and better! 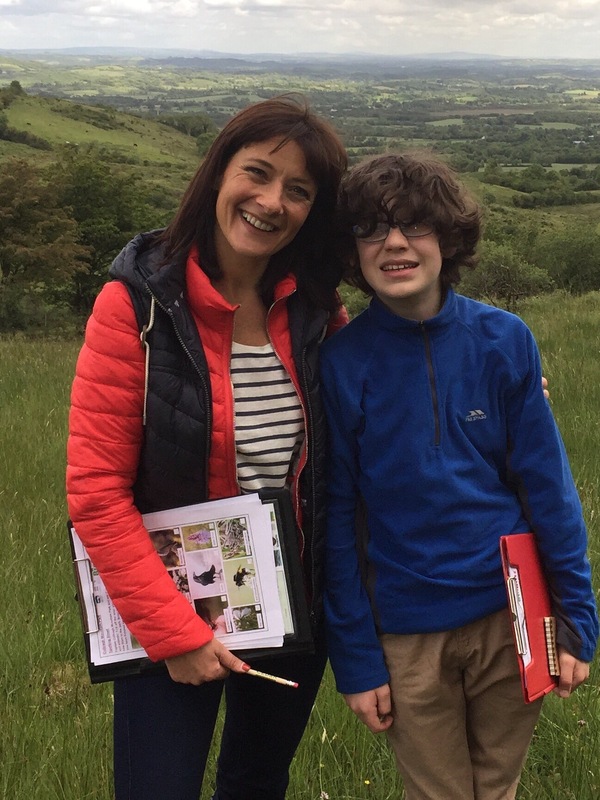 Thanks also to all the young naturalists and conservationists who inspire me and decrease those feelings of isolation that we sometimes feel – as young people with specialised interests. It sometimes exasperates me that not enough people care, but I’m moving away from that way of thinking, those feelings only disempower us to give up – and I have no intention of doing that! One big positive about having Autism? We never give up, we keep going until the job is done. Protecting nature will never be done, so we need more people…like me. One of the things I am most proud of, is raising money for a very special project. In January I raised over £6,000 to satellite tag raptors. I shyly presented the idea to the Northern Ireland Raptor Study Group and we/you are making it happen. I walked over mountain and upland in January 2018 to complete the fundraising and later in the year, birds will be tagged – to help against persecution, to help science and conservation. That will be a wonderful thing. My passion is involving young people, showing my excitement for nature and seeing their eyes light up too – it’s magical and necessary if we are going to solve the many ecological problems we now face. Looking back, I almost feel that this has all happened to someone else and then the realisation comes. As I write, these words are me, on a good day…when I’m not overpowered – on those good days, do all the good things, so you can look back and know that you tried your very best. One day, I hope that the good days are so consecutive that I’ll almost feel like I’ve migrated somewhere exotic, like a swallow. That would be nice. Thanks as always for reading and your incredible support and encouragement.